Today we're sharing an easy twist (literally) on the basic box knot tug toy, so that there is a how-to here to go with one of the special toys for Humphrey's second birthday (stay tuned for birthday bonanza shares all next week!). A basic box knot tug toy is simple, sturdy and good looking. Check out this post for detailed basic box knot tug toy instructions. If you weave evenly (see troubleshooting tips here), the toy will be squarish, as you would expect from a straight box knot, with uniform bands of colour down the sides. 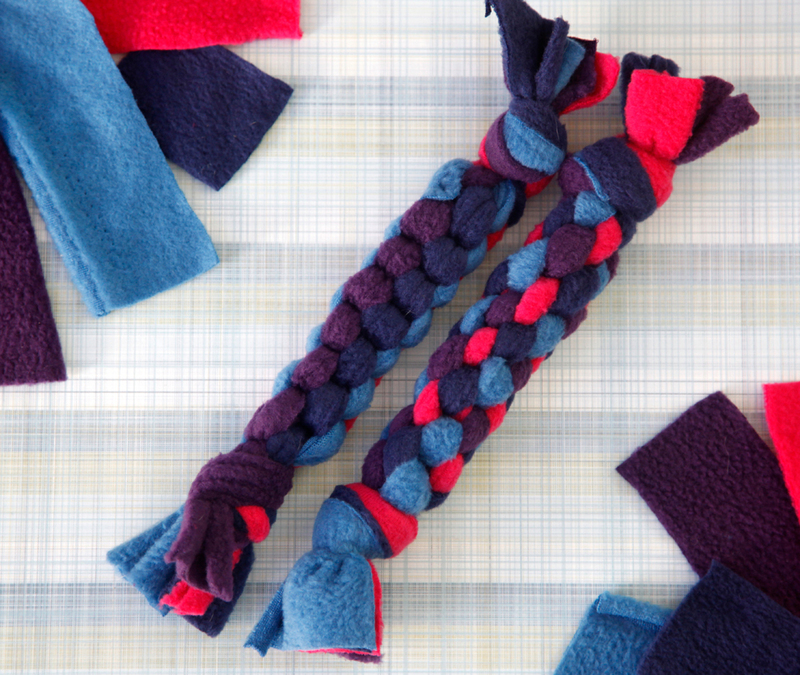 These bands (if you are using different colours) come from your chosen four fabric strips, with left/right alternating beside top/bottom throughout the length of the toy, as shown in the example below and the detailed basic tug toy tutorial here. For a variation in style and appearance, you can twist while you weave, rotating each strand by one position after each knot. Side strands become the top/bottom strands, and the top/bottom strands become the sides, as shown below. As you then tie with the same method (details here), each layer includes a quarter twist along with the box knot. This quarter turn rotates the colours on a diagonal, which makes for a pretty multi-coloured touy with four strands or a diagonal stripe when made with two colours (which you'll see in next week's birthday toy). It also softens out the square box knot into a more rounded tug toy. If this is your first attempt at weaving, you may find it helpful to work with either two alternating or four different colours so it's easier to keep track of the strand movements until you get the hang of things. As an added bonus, it's cute too! To keep things in position while you twist and tie, it helps to be seated with the toy nipped securely between your legs/knees. In terms of sturdiness (read more about that here), they are both similar - I find it depends more on the size of the strands/toy, tightness of your weave, and (of course!) the vigor of the play than the style, although it can be difficult for beginners to weave the twist toy tightly for a solid tug. Why not make both? Choices choices... :) Note: You can also use the Circle Twist method for the same effect as the twisted box knot, if you'd prefer. You can read more here if you're interested.